I've been mulling over it all afternoon and I'm still not sure how I feel about it. 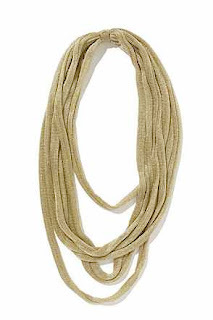 I know I'm not the only one making fabric necklaces and so it's unlikely that Country Road are copying me directly. 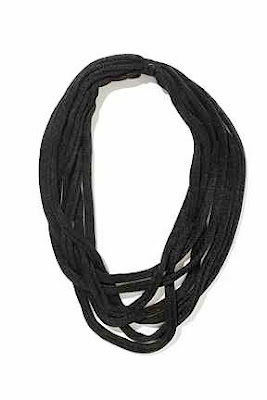 When I first started playing with my fabric necklace ideas, I discovered Necklush in the US, who do big chunky scarf-like pieces, fashioned from t-shirt type material that is just cut and then rolled/ curled. Since then I have also come across a couple of other local designers working with strands rolled fabric, often using recycled t-shirts. Late last year someone even pointed out Supre where doing something similar, but theirs had metal studs attached (how very Supre). From what I can tell from the snaps on their website alone, Country Road's designs are done in a similar way to these others I have seen, with rolled as opposed to sewn material too. I could interpret it as proving I am onto a good thing. More people might "get it" when they see mine - which was sometimes a problem when I did markets like The Rocks which attract a pretty broad and generally very mainstream crowd. I am biased, but I think mine are much more interesting and versatile. They are charging almost $80 for less interesting, mass produced pieces. It's a good reminder to get stuck into evolving my pieces and creating new designs to stay a step ahead! On that last note, I should get making! Take it as a compliment at how cutting edge you are Phoebe... i always get comments about how lovely mine is :) Carrie. I agree with Carrie. Take it as a compliment! Keep up the good work hun, i cant wait to see what you come up with next!